The ultimate pork meat which delivers an intense flavour! 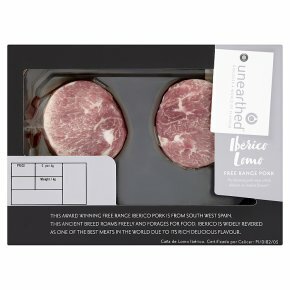 This award winning free range Iberico pork is from South West Spain. This ancient breed roams freely and forages for food. Iberico is widely revered as one of the best meats in the world due to its rich delicious flavour. Cook, season, then serve with all your favourite tapas for an impressive Spanish spread, or simply as an alternative to steak. Keep raw meat separate from cooked foods.<br>Always check that the product is cooked throughout until it is piping hot and no pink colour remains. Place on a baking tray and put into a pre-heated oven on 200°C for 9 minutes. Allow meat to rest for 2 minutes before serving. Coat the meat with a little oil and pan fry on a moderate heat for 2 minutes on each side to seal.